First things first, I opened my care-package today. I received an amazing box of goodies! I really like it! There are two crochet puppets, they are so cute. A plot catcher and a wooden plotbunny, a handwarmer, notebook, a pen and a mechanical pencil. There are also a couple of candles and a couple of Lush soap samples. There are also five little bags which have a number on them 10 – 20 – 30 – 40 and 50 which I can open when I reach 10 000, 20 000, 30 000, 40 000 and 50 000 words. I really like the care-package I received, it’s so much fun. If I’m going to do Nano next year I’ll make sure that I sign up again, I’ve had so much fun looking for presents for my package and also opening the one I received. I can recommend it to anyone! The anticipation is over, the prep period is over. Now it’s time to get the writing done that I have been looking forward to since early September. Because that is how long I’ve been preparing myself for November, I’ve been looking forward to this moment for such a long time. Since I’ve been doing all this preparation you might expect me to finish the first day with at least a days worth of word count – 1667 words… But I don’t have it. In all honesty this is the first year that I have not written from 0.00 to 1.00 last night. I was too tired and during the day today I was busy. I only got home around eight and haven’t done much writing ( besides this post ). I’ll make it up tomorrow, right now it’s time for bed. One thing is for certain, this is the strangest start to Nanowrimo I’ve ever had. I’ve always participated in the midnight kick-off even if it was a weekday and I had to work the next day. Just during this past year many things have been different, I’ve been more stressed due to my work situation and I have been changing and adjusting my sleep patterns to a more healthier pattern. Which means that I am more used to getting to bed around eleven that I am at a later time nowadays. So by that standard right now is bed time for me. So the actual start of Nanowrimo for me has to be tomorrow. Like I said in my previous post – Preparation is key – in my case the preparation really is the most important part of the process. I know that I can do the writing that ain’t the problem – I mean I’m not claiming that I’m good at it, just that I know how to do it. The problem is that while I’m writing I keep coming up with better ideas, which means that a lot of my writing ends up in the dumpster – so to say. And that’s a shame because there are a lot of hours I put into it, a lot of time spend sitting behind my computer fleshing out the scenes. And I knew that if I ever want to finish a story I have to start at the right place to really give it a chance to become as good as I can make it. So in September I started thinking about my story (that’s not completely true I’ve been thinking of this story ever since November ended) – of course I’m doing a re-write so I already knew some of the changes I wanted to make in regards to last years version. At the same time it was also really clear to me that I needed more changes to make the story even more interesting and appealing. Which is why I was reading through the book ‘Outlining your Novel’ and the ‘Outlining your Novel workbook’ by K.M. Weiland. I really like reading through the books, there were obviously things which I already knew but sometimes you just need that step by step explanation to get to the point of the matter. It also helps when the examples given are of a more modern nature – Star Wars, The Hunger Games and some movies that I’ve seen. Often – in other books – I’ve seen examples given by using the classic novels – I love reading yet I have to admit that I have never really read the big classic novels. So using those novels as examples doesn’t always work at least not for me. About two weeks ago I came down with the flu and I had to stay home for about a week before I was feeling well enough to go back to work. During that week I was able to work on my outline and think about the scenes I want to use in my book. And I think that at this point I’m about half-way through the outline of this book. And I’m really excited to really start working on this story, I really feel like this could be an interesting story to tell. Another part of preparation – The Nano Kick-off party! Yesterday, October 24th was the day we held our national kick-off, in Utrecht like we always do. It was a really well-organized meeting. The only downside for me was that since I’ve been sick my voice has been really bad and during the afternoon and evening my voice became more and more of a problem. So it was pretty hard to talk to people – which meant that I basically kept to the people who I already knew. Nevertheless I did have a great afternoon, I enjoyed myself and I’m really glad that I went. I also participated in the ‘care package exchange’, it was the first time that I actually took part in it and I really enjoyed myself. I found some really practical, cute things to add to it. When I arrived the Dutch ML’s (municipal liaisons) started laughing – the reason was that the person who made my package for me used the exact same wrapping paper as I did for my package. The only downside is that the person who made my package is really testing my patience … it says that I can’t open it before November 1st. So I guess, I’m going to have to wait a little while longer. 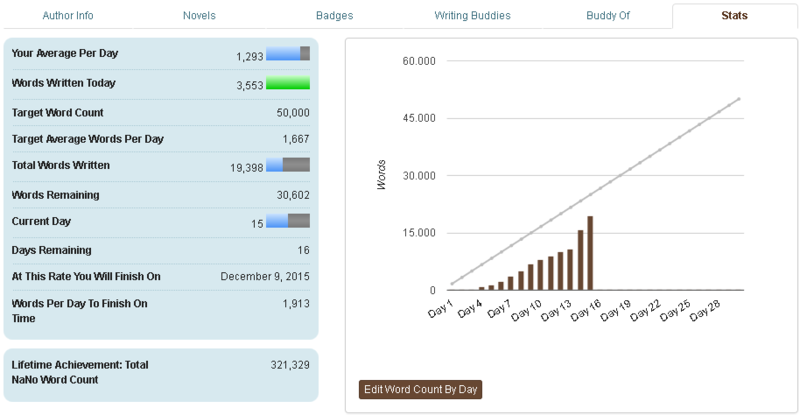 There are only seven days left before Nanowrimo starts! Are you going to participate? What are you going to write about? Preparation is key. That is one of the things I have definitively learned the hard way these past years during Nanowrimo. Not that Nanowrimo has been hard these past years, that is not what I meant to say by that statement. During those November’s I was on a roll and nothing could stop me. But in December doubts started to roll around and I knew that I could improve the stories I was working on by changing a lot of different smaller and bigger things. This is what happened last year. I had the idea for my story pretty much thought out, however not much of it was really planned out. I choose a point on my time line which was too far back – before the action. So when I reached the end of November and also that magic 50k line I was still getting into the story. The build-up was too slow and took way too long. It wasn’t bad, I got to develop some of the characters in depth – which I am sure I can use to my own benefit this year but not in the way I wrote it last year. More as background info and a better understanding of the characters I’m writing about. That was a huge mistake I made, I could have thought it out better – took more time to go over the details polish it up before November. I didn’t, partly because I never before took the time to plot before I started working on a story. I read the book ‘Outlining your Novel’ by K.M. Weiland and as I said in my review of the book it helped me to get a better understanding of the process. You have to start where the action is, grab the focus of the reader and keep them interested. I have been thinking about my story idea this past year and due to that reason I have also decided to change another significant character drastically. Last year my character ‘Ezra Miles’ was my main characters best friend. He took care of her and basically cared for her because she needed the help. However during this year I have decided that he’s going to be the exact opposite, he is actually one of the people who makes her life even more difficult. Reason for that is that I belief that it will make for a more interesting and surprising story. For instance yesterday I wrote the premise sentence for my story. Which I formed due to the answers I wrote down following the questions from the ‘Outlining your Novel workbook’ written by K.M. Weiland (which is also part of my Reading Challenge – there will be a separate review for this book). This premise sentence says enough, without revealing too much. Although I do think that it’s still a little bit too lengthy, but that’s okay I can live with that. Ainsley McCallum (protagonist) wants nothing more than to be a normal member of society. Instead she’s been living on the edge of her community (situation), because she never received her ‘sign’. When she finally gets her ‘sign’, she almost wishes that she never had (disaster) because she finds herself being chased by the Watchers (opponent). They want to stop her from reaching the people who might be able to give her the answers she’s seeking (objective). I’m going to work through the book, see what I can use from it and if something doesn’t work for me I will see what I can change to get on with the work. I love it, I thought that plotting would be boring that it would take the fun out of the experience but so far it has been great. Although of course the real test follows in November. Will it still be fun to actually work on the story? Or am I going to be so done with it that I can’t get any real writing done? I really hope that it doesn’t come to that, because with the year from hell that I have behind me I need November to be extra fun! And I really hope to accomplish something during November so that when I look back at this year I have something to look back on with a smile.